I’ll admit it. 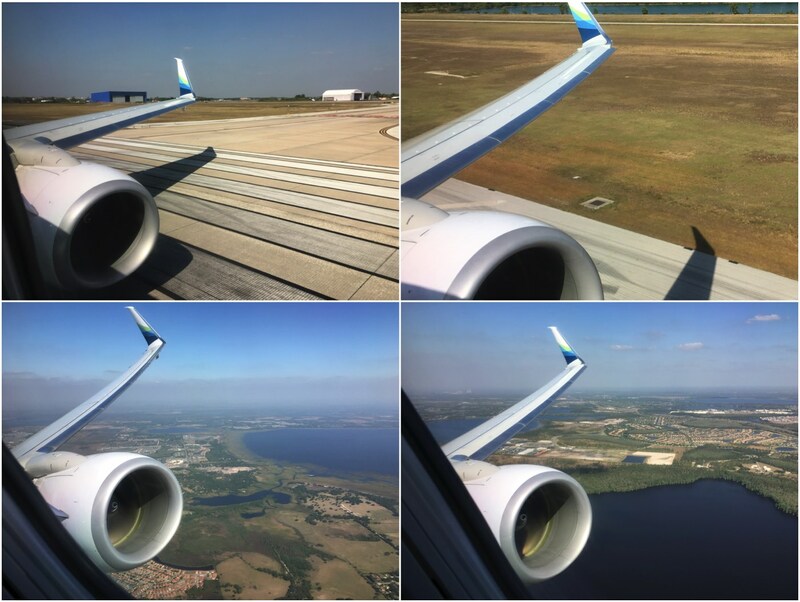 Having just written a full review of Alaska Airlines 737-900 first class from San Diego to Orlando, a small part of me felt like taking the easy way out and reposting that exact same content in reverse. That would technically count as an Orlando to San Diego trip report, right? I could probably get away with it considering that everything about the return segment home to San Diego was nearly the same as it was on the way out to Orlando. 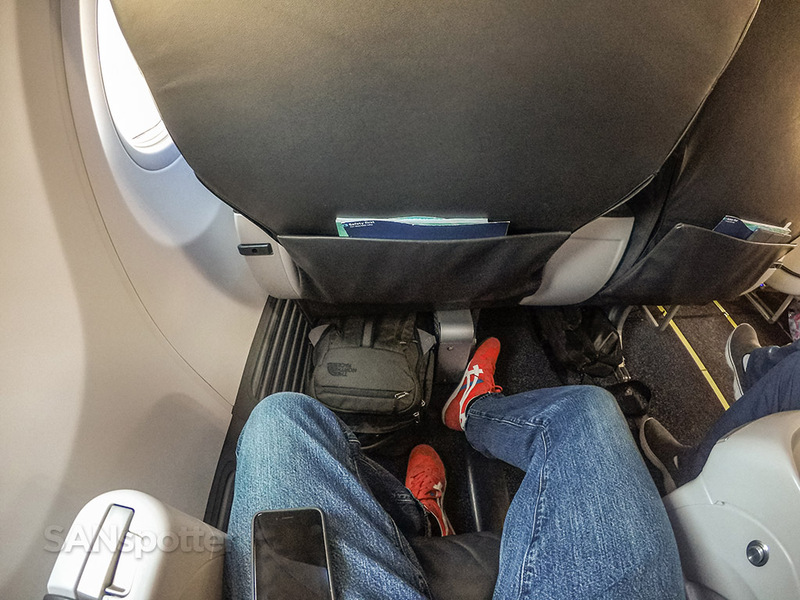 It was the same airline, the same aircraft type, and even the same seat (4A) for crying out loud. 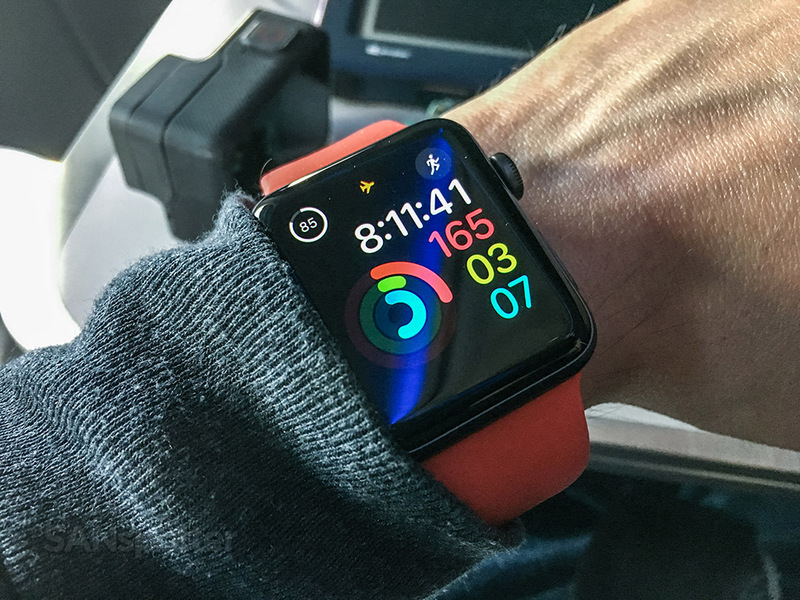 Luckily for you, I have a natural tendency for working harder rather than smarter (it’s a curse, let me tell ya), so here we go with another full review of the product that I just wrote 1500 words about a few days ago! Alaska Airlines 737-900/ER (N434AS) side view illustration by norebbo.com. This wasn’t a very fun livery to illustrate (asymmetrical overlapping swoops give me heartburn), but it might just be my #1 favorite at the moment. Seat map of this Alaska Airlines 737-900/ER (courtesy of seatguru.com) showing my seat (4A) for this flight to SAN. My parents live about an hour and a half south of Orlando along the Atlantic coast, so my day began mentally preparing myself for a drive up the I-95 over a bowl of Cheerios. Dad insisted on grilling burgers for before I left (“you gotta start the day with a good meal!”) which wasn’t totally necessary considering that I had to be out the door at 10:30 AM and those Cheerios hadn’t even started to digest yet. So there we sat as a family out on the back porch eating burgers at 10 AM even though nobody was hungry, and it didn’t bother me a bit. My dad is cool as hell. 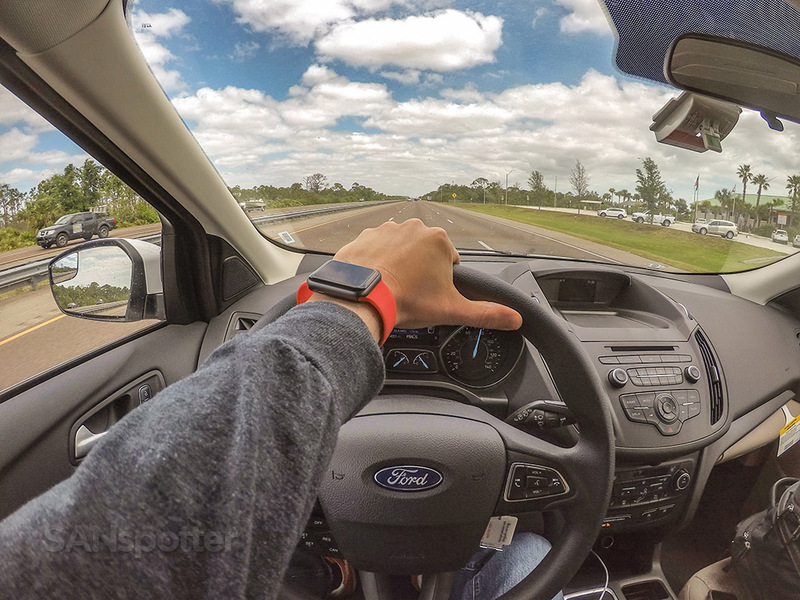 Cruising at a pretty good clip up the I-95 on the way to MCO, second-guessing my decision to leave early to avoid all the “crazy traffic”. 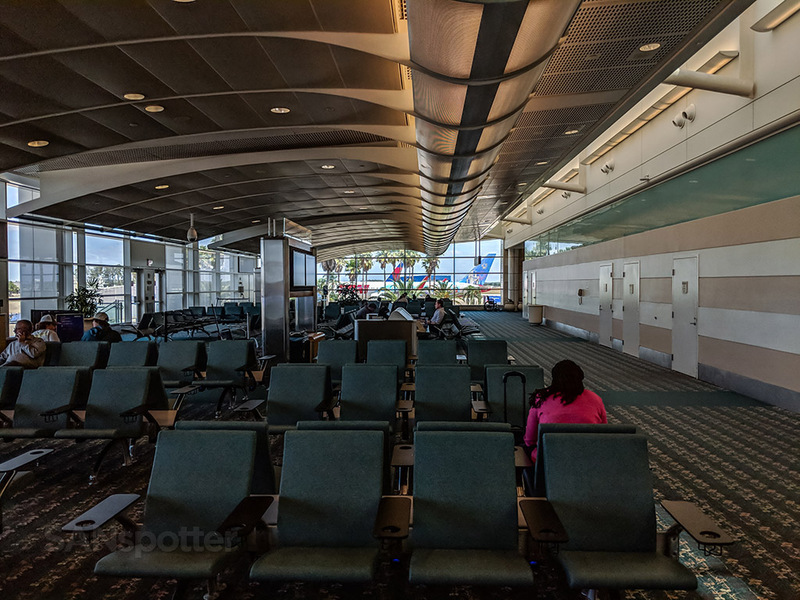 Despite expecting congestion worse than the 405 in LA, there was absolutely zero traffic on the drive up to Orlando and I arrived early with plenty of time to kill before my flight. 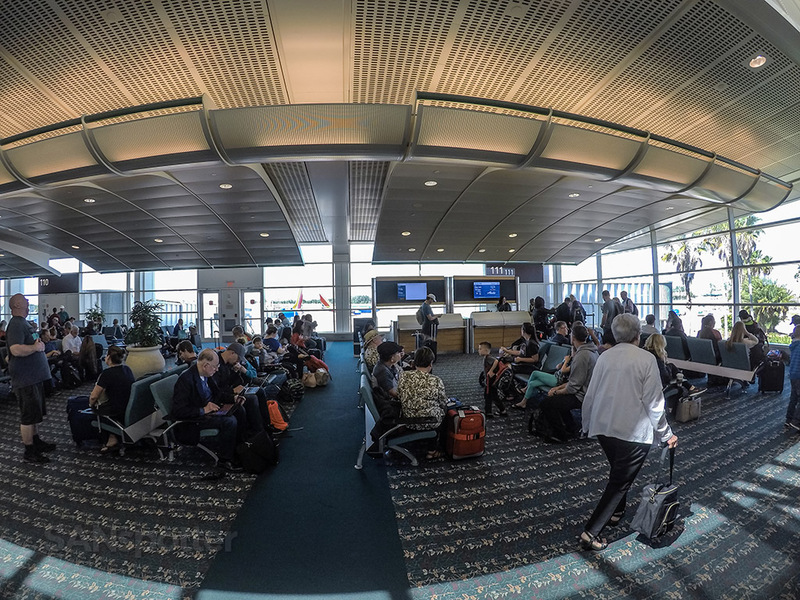 Everyone had been telling me how much of a zoo MCO was going to be with it being spring break and all, but it was a total breeze and I was checked in and through security in less than 15 minutes. Yeah, “anticlimactic” is probably the best word to describe the start of this trip home. 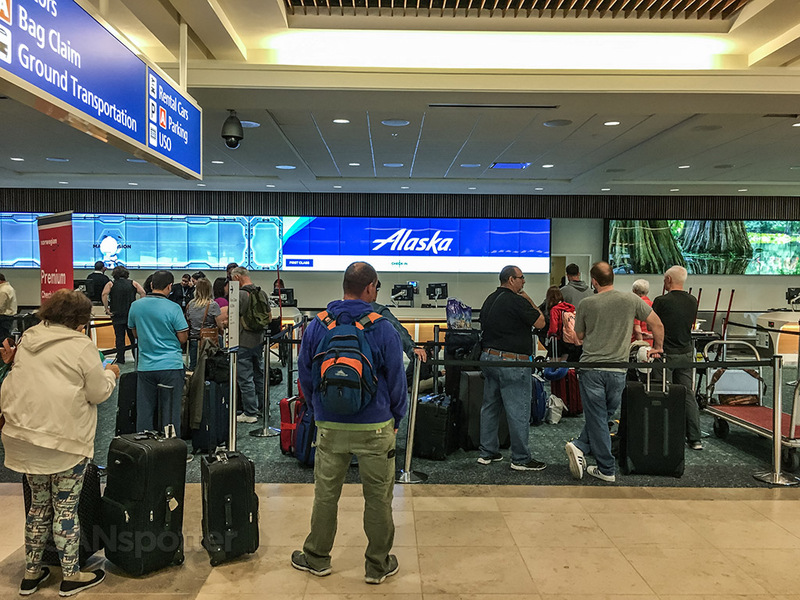 Somewhere down this hallway is the Alaska Airlines ticketing counter. I think it’s right down there past Copa and Avianca (a subtle reminder that I need to try both ASAP). Bingo. It’s a good thing that I’m traveling light today with only a carry-on bag, because that line looks almost as much fun at the one down at the DMV and I wanted none of it. I was half tempted to walk up to that information desk and ask about the maximum range of a fully-loaded 737–900/ER (just to test how smart they actually are). 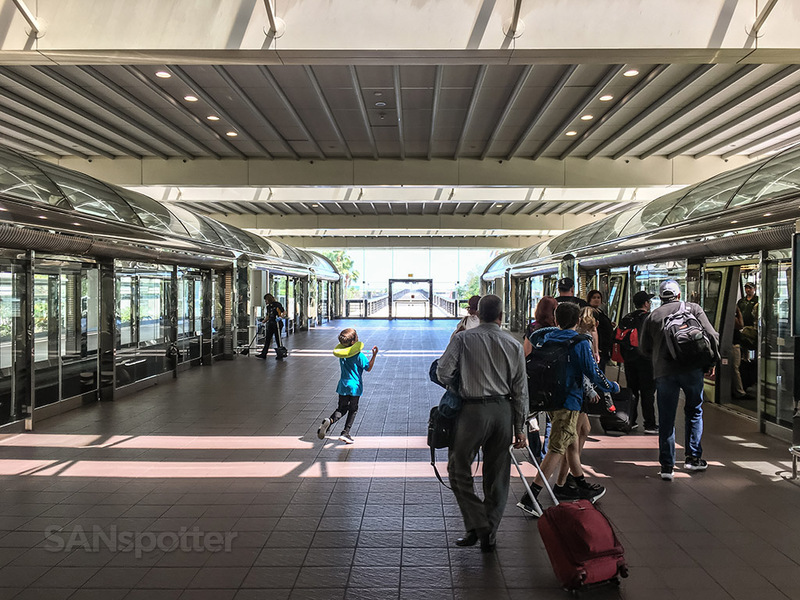 There are four satellite terminals here at MCO, and the only way to get to them is a ride on the tram. This is the home of Disney World after all, so it felt totally natural. Is that an ugly train or what? It was fun though! As usual, I am one of the first to arrive at the gate. But hold on a second… I see some interesting birds out there. Let’s go have a look! How perfect is that? It’s a TAM 767–300 with a Disney livery. I’m guessing that this plane has been here a time or two before. 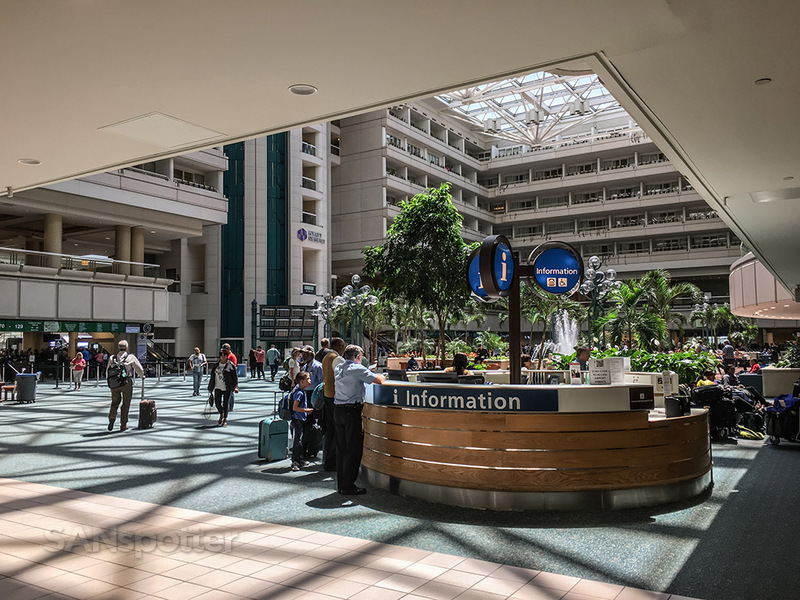 If you’ve never been to MCO, you would probably be very surprised at the amount of international traffic that filters in and out of this place. From Emirates to Thomas Cook to TAM (and everything in between), it’s obvious that the entire world has a strong fascination with Mickey Mouse and all of his Disney-branded friends. Maybe it’s because I live in the US and I first went to Disney World at a very young age, but it’s interesting to me that people would fly in from all over the world to burn up valuable vacation time at Disney World. Not that there’s anything wrong with that, but I just don’t get it. OK, I’m getting way off track here and this hasn’t been much of an Alaska Airlines trip report so far. 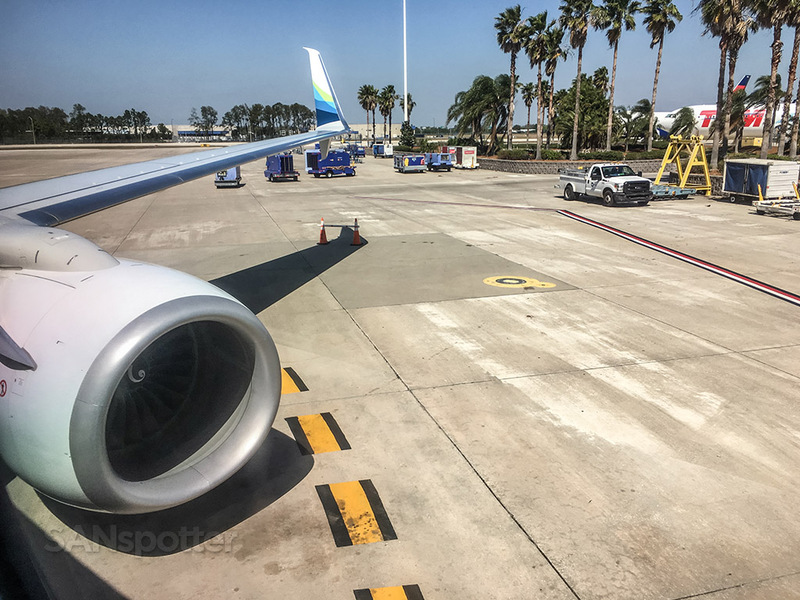 Telling you that the aircraft doing the honors of flying me from Orlando to San Diego this afternoon was wearing the new livery would be a fantastic way to get this pointed in the right direction again, so let’s do that. Yep, I was pretty excited about this because I haven’t had any luck getting on an aircraft wearing these new colors yet, and that was kind of cool. Finally! After all these years (ok it’s only been two) I’m finally getting a chance to get a ride on an AS 737 in that beautiful new livery! 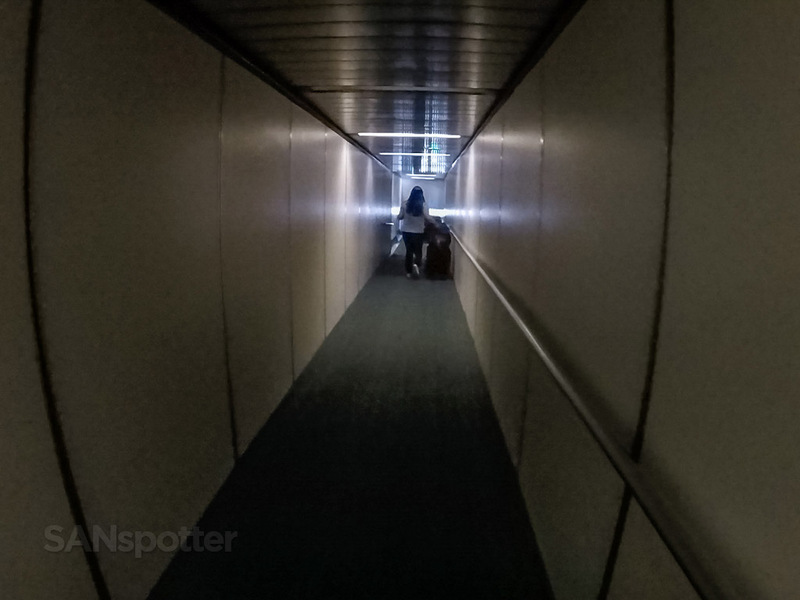 I thought for sure that it was going to be a very light load to San Diego today, because the gate area was fairly empty up until about 20 minutes before the boarding process started. 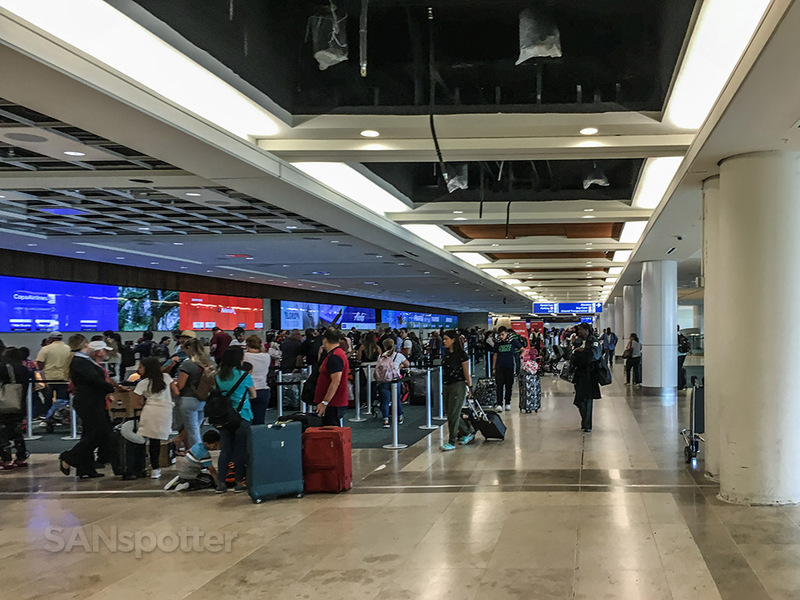 It filled up really quickly after that though, as if they were all waiting until the very last minute to leave Disney World before coming to the airport. I could only dream of having precision timing skills like that, because I always seem to show up stupidly early wherever I go. Starting to get busy here at gate 111! It’s always a special feeling to be considered “First Class & Elite” – most days I’m just “Dull & Insignificant”, so I was really enjoying this moment! No, this isn’t creepy at all. Hold on a second…still trying to get to my seat. There we go! 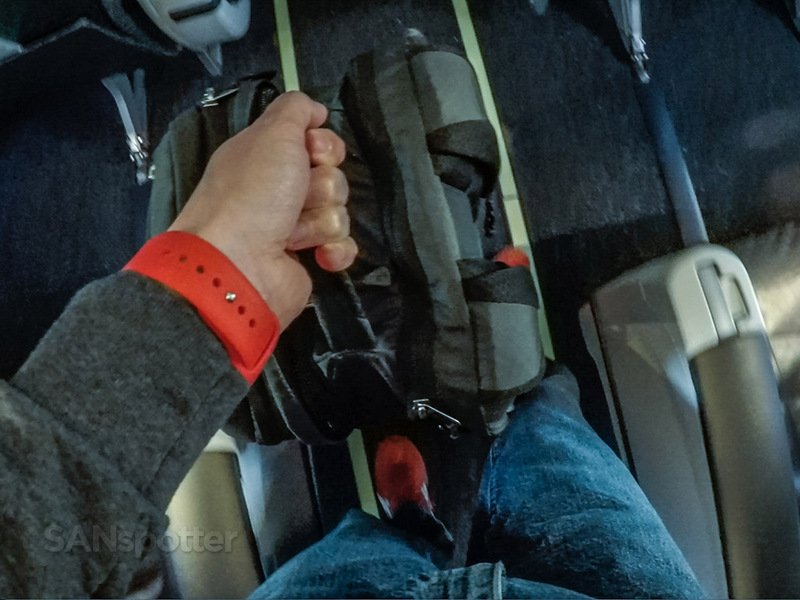 Oh, and thanks mom – I appreciate all the snacks and goodies you threw at me as I was leaving, but it has made my backpack even fatter and even more impossible to fit under the seat in front of me. 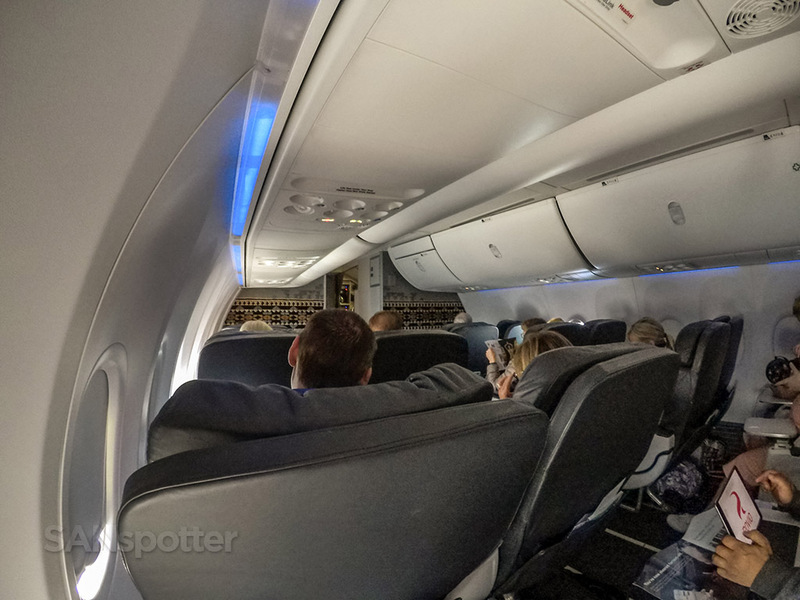 It was indeed a full flight this afternoon, and it took a good long while to get that 737–900 filled up ‘til no seat was left. 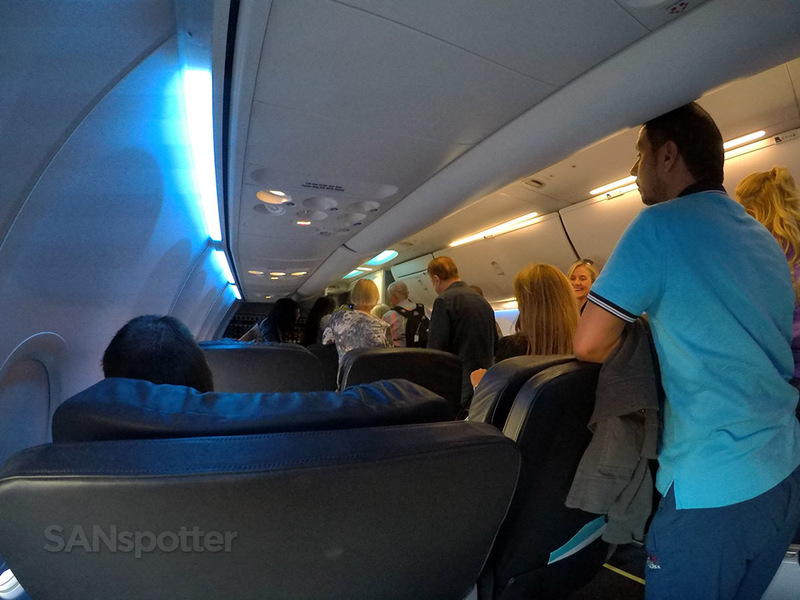 I passed the time by taking pictures of the safety card and sipping on water (usual SANspotter stuff) while the rest of the passengers up here in first class did far more normal things like stalking on Facebook and taking advantage of the free alcohol. A completely different menu than what was on my previous flight. I’ll bet that you’re just dying to know what I chose! Or maybe you couldn’t could care less and are looking forward to my next trip report instead? It’s OK. I don’t mind. 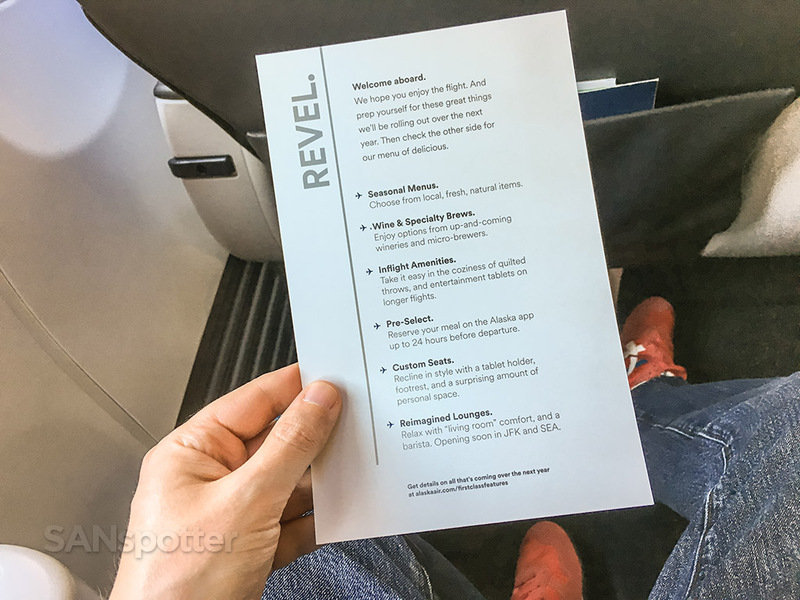 Unfortunately, the backside of the menu which explained all the things that are coming to Alaska Airlines in the next year hadn’t changed since last week. 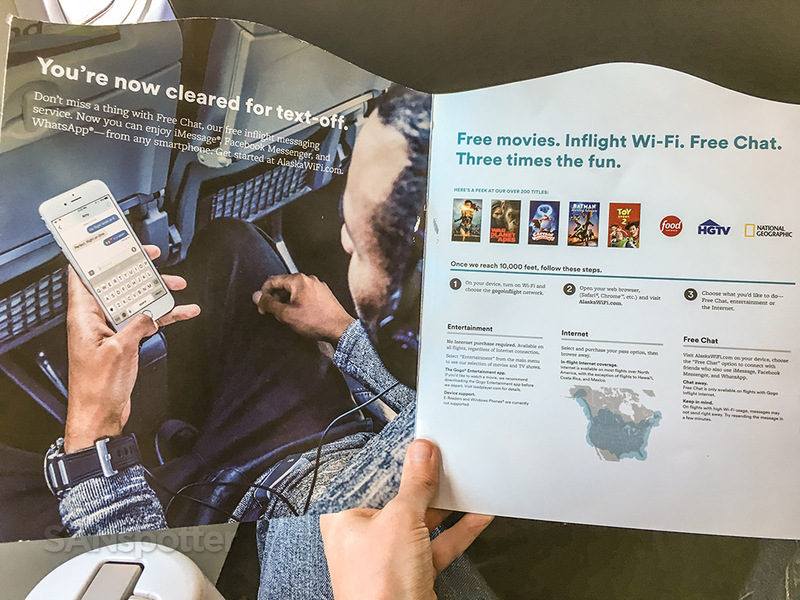 I’m still waiting for them to come to their senses and announce a fully lie-flat business class product between the West Coast and New York, but I’m seeing no mention of that here. 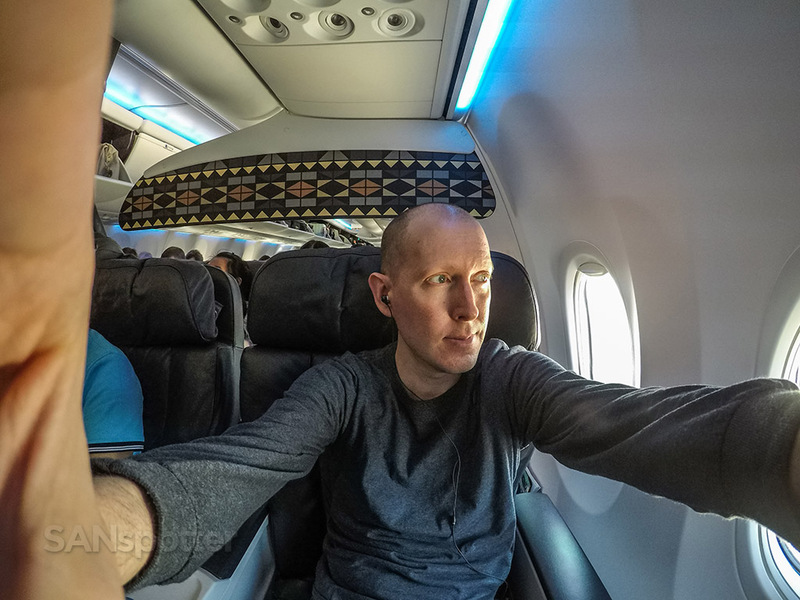 Not only am I sitting in the exact same seat on the exact same kind airplane that I was last week, I do believe that I’m wearing the exact same shirt as well. I hope nobody notices. Just as it was on the way in to Orlando a week ago, the skies were clear and bright as we made our way out of town and pointed west towards San Diego. 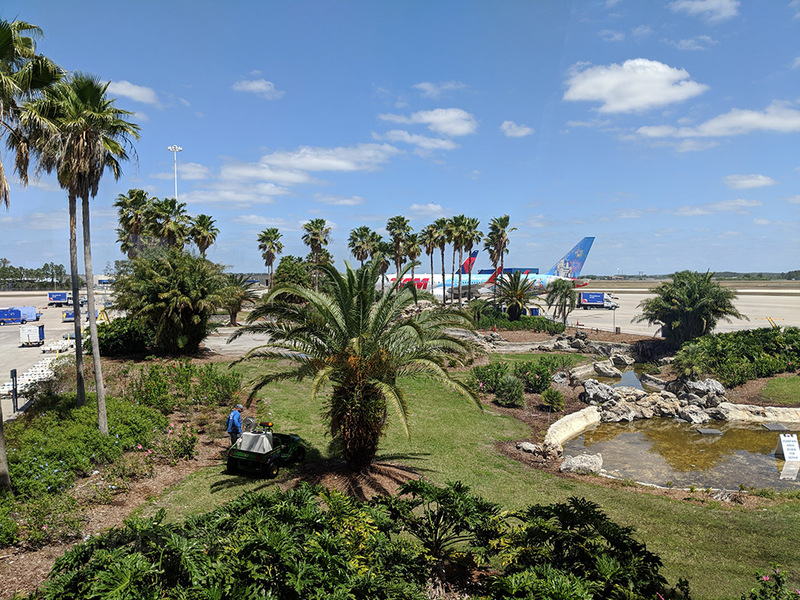 Experiencing such nice weather in Florida is nothing short of odd to me, because if it’s not raining cats and dogs by 3 PM, it’s hard to remember that I’m actually in Florida and I might as well be anywhere else in the southeastern United States. Afternoon thunderstorms are mandatory in Florida – will someone go please remind Mother Nature of this? Pushback. It was right about this time that I was thinking about how well traveled this airplane was. It probably spends a lot of time up in Alaska, and here it is way down here in Florida today. 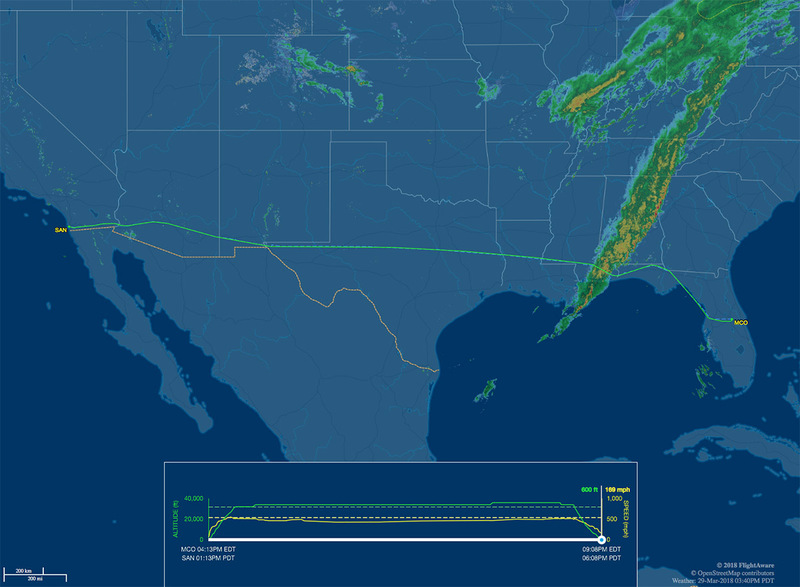 That’s a long haul for a 737! 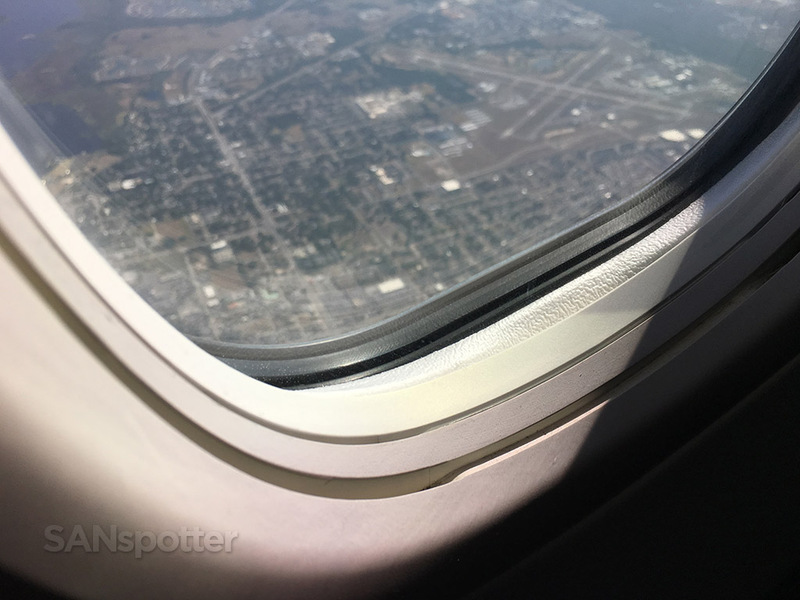 “I think Disney World is over there on the left in that dark spot!” “Nuh uh, it’s back there on the right…” (the things you hear from other passengers when departing MCO). 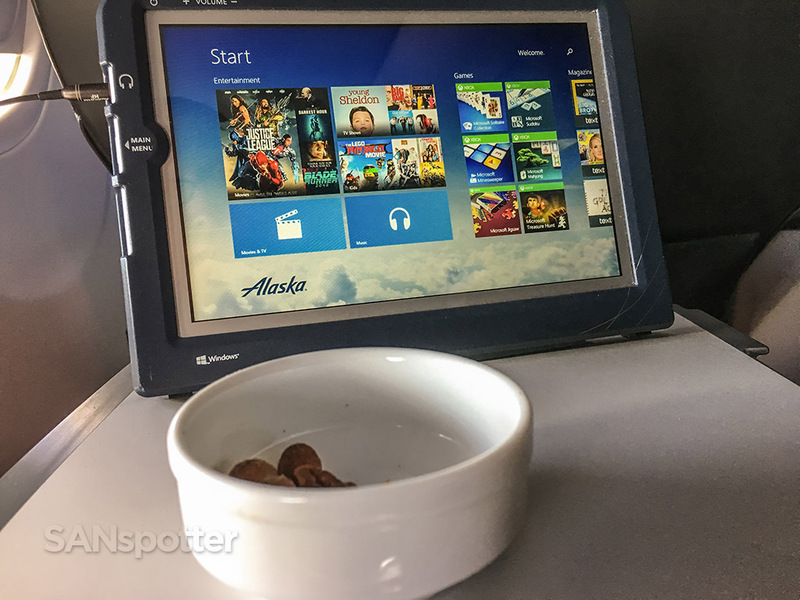 I am a huge fan of consistent airline products, and 20 minutes into this flight I was feeling pretty good (and having deja vu) about the Alaska Airlines first class experience. So far it had been a complete mirror copy of what I experienced on the San Diego to Orlando segment one week prior. 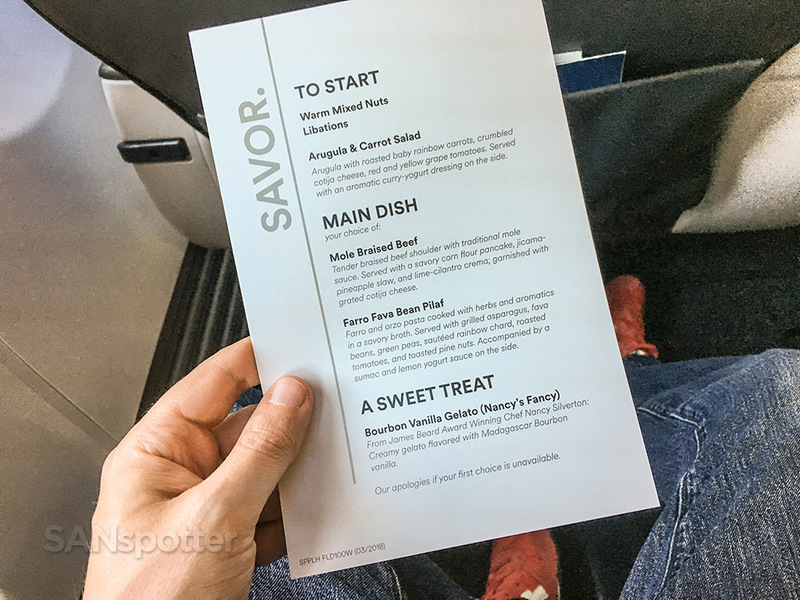 Menus were distributed while on the ground, with drinks and warm nuts arriving exactly 10 minutes after takeoff. 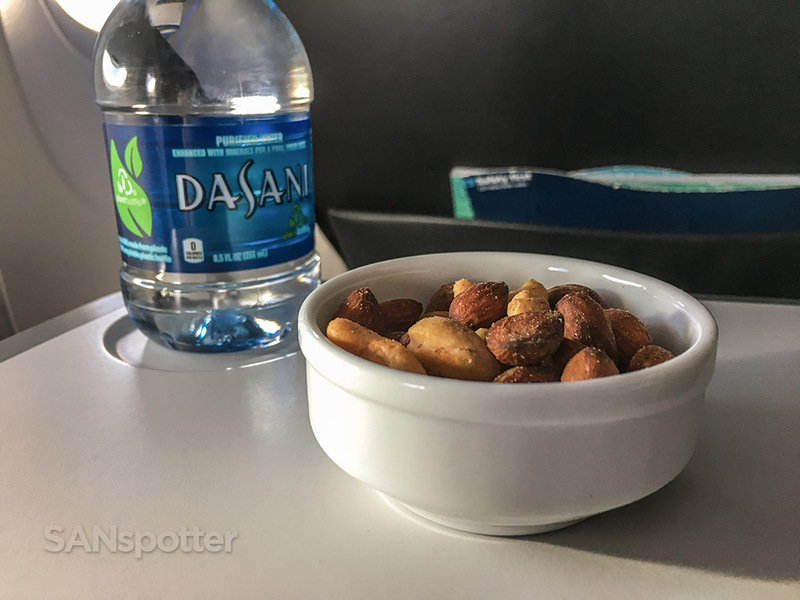 The service was so completely identical to my previous flight that it would not have surprised me one little bit if there were the exact same number of nuts in this dish as there was last time. Dang it, I should have counted! Complementary portable video players were also handed out just like last time, so I decided to take advantage of the freebie and see what it was all about. This is a trip report after all, and I’ve got to try everything even if I don’t really care to watch movies or TV. Long story short, it was actually a nice little Microsoft-based product. Android and iOS offer the best mobile experiences by far, but I’m happy to report that this felt fairly high-end and I never cursed once as I tried to find something good to watch. Dang it. My snack is nearly gone and I haven’t even started watching anything yet! Lunch was served approximately 20 minutes after the warm nuts, and just like last time, those of us in rows three and four had to wait while those in rows one and two feasted like kings. Yes, the service is slow, but at least they’re consistent and it was exactly the same as it was on my previous flight. I don’t mind slow service as long as I know what to expect going in. The vegetarian option seemed like the responsible choice considering that I had already eaten two hamburgers before 10 AM today. 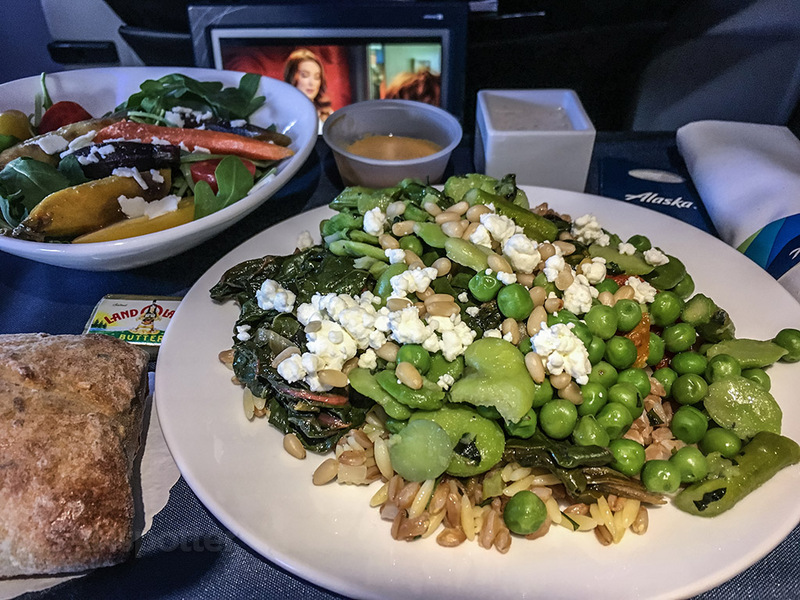 There’s not much room to spread out and eat comfortably here in Alaska Airlines first class, but if you put food in front of me I’ll find a way to eat it. 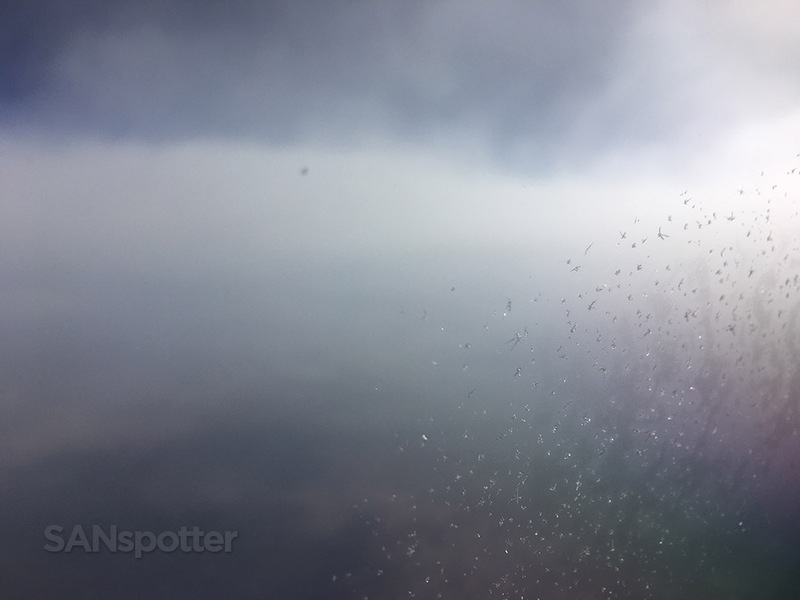 What is it about gazing down on the clouds below that makes you reflect upon the fact that you’ve eaten a ridiculous amount of food over the past week and that things need to change as soon as you get home? 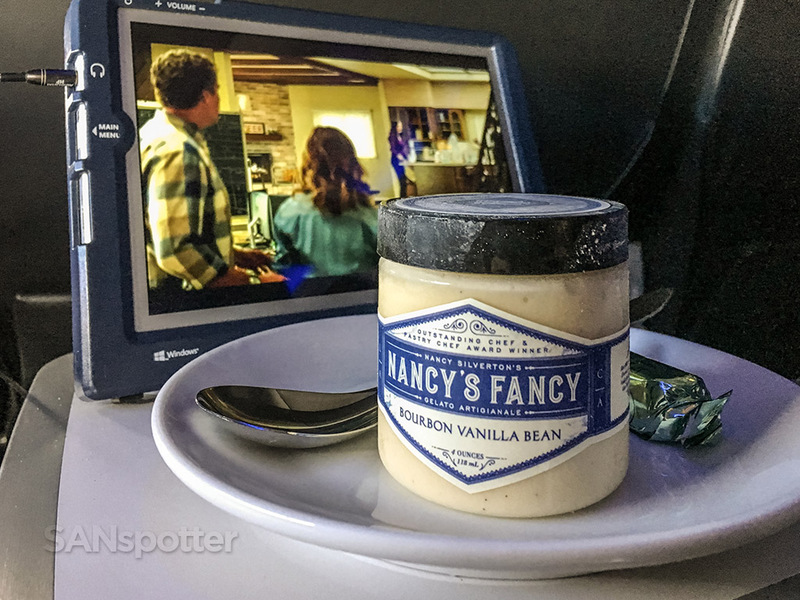 The only thing different about the service this time compared to last was the timing of the rock-hard Nancy’s Fancy vanilla ice cream. 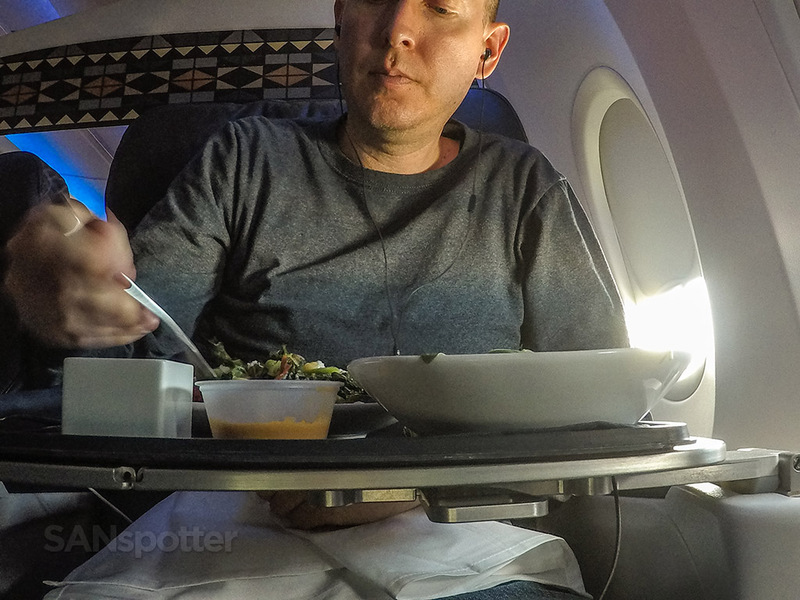 On the flight from San Diego to Orlando, they served it approximately one hour after the meal. 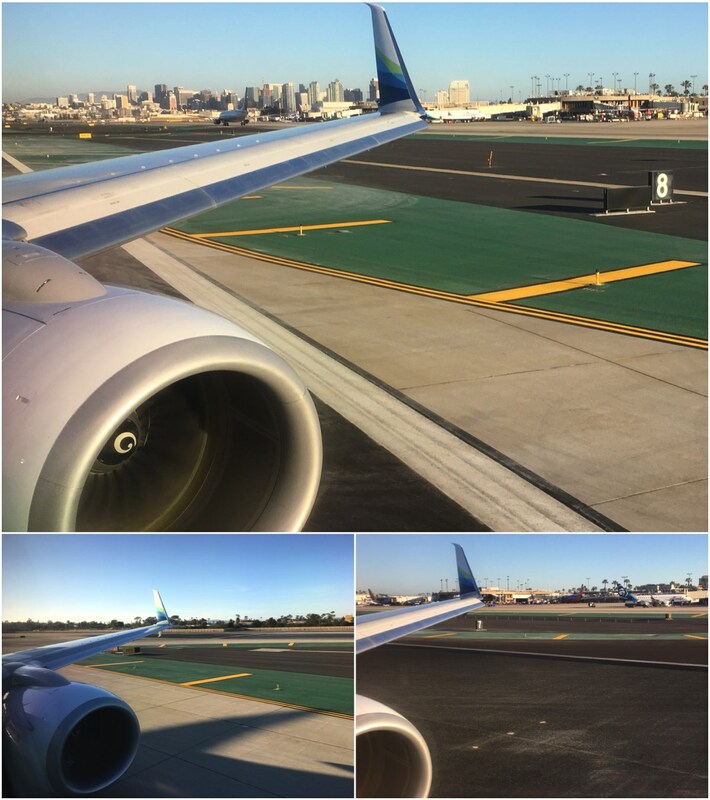 On this flight to San Diego, it came immediately after they cleared the trays. And no, I totally did not need ice cream today considering that I was eating hamburgers by 10 AM and I had just finished a huge carb-loaded lunch. Although unnecessary, ice cream is really hard to resist when it’s sitting there right in front of me, so I tipped my hat to Nancy before diving in head first. Damn you to straight to hell Nancy. I totally don’t need you right now, but you’re just so impossibly hard to resist. The majority of the flight after the meal service consisted of napping on and off in between tinkering with that portable video player. I don’t really know what the deal was, but my attention span was not strong enough to watch a complete movie from beginning to end and I just went back-and-forth from napping to watching to napping to watching. 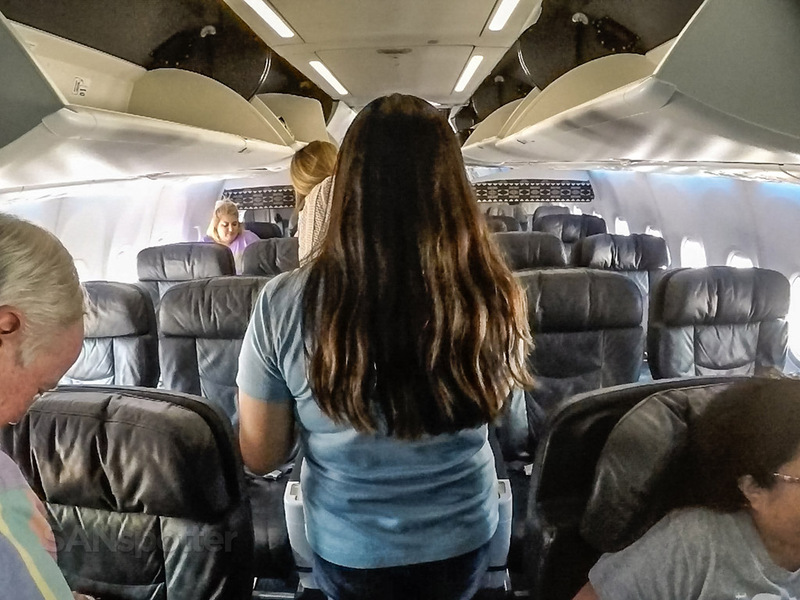 The flight attendants kept busy by coming through the aisle every now and then with beverages and snack baskets, but putting more things into my belly was the absolute last thing on my mind. I had consumed a sufficient amount of calories for today, and I felt ashamed even thinking about food. Finally! 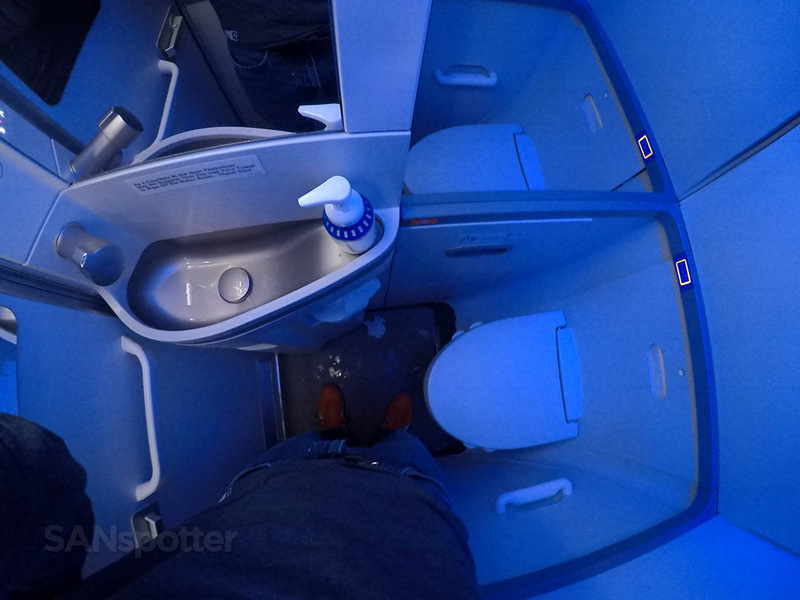 Do you have any idea how satisfying it is to be able to post a picture of an airplane lavatory that isn’t a cookie-cutter copy of hundreds of others that I’ve already posted? This is a good looking bathroom, complete with deep blue mood lighting! OMG are we there yet? I dare you to stick your head out the window and lick the side of the airplane. Looks cold out there! 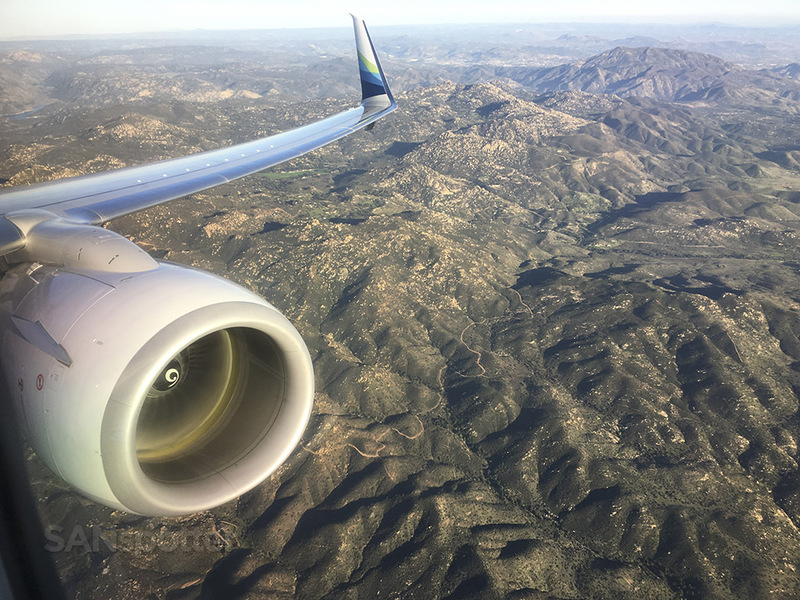 Our arrival into San Diego was nothing short of amazing. 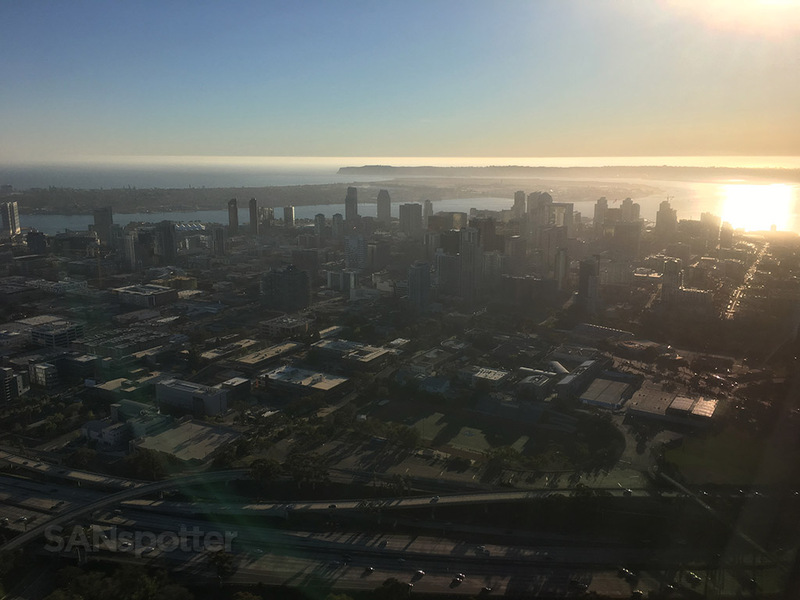 The initial approach over East County wasn’t the most spectacular I’ve ever had into SAN, but it was at the very last moment right before we reached the tallest buildings of downtown that the magic happened with the angle of the sun reflecting off the rustic textures of this city. Man I love San Diego! It was one certainly of the best arrivals I’ve ever experienced here. 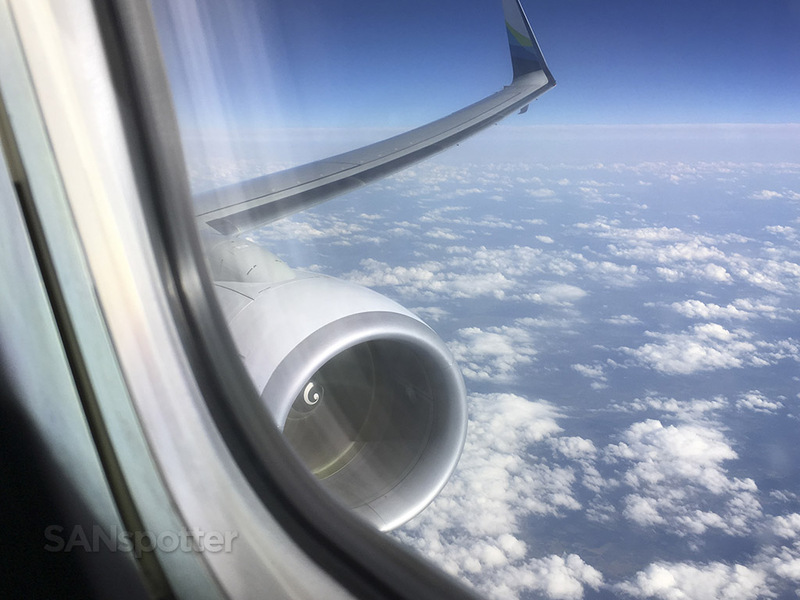 After five long hours in the air, hearing the engines spool down and feeling the plane begin to drop is the sign that we are almost there. It could also be a sign that are about to crash really hard into a rocky mountainside, but I had faith that the pilots had done this before and I wasn’t scared. That right there is pretty much the opposite of Florida. It’s nice to see mountains again! 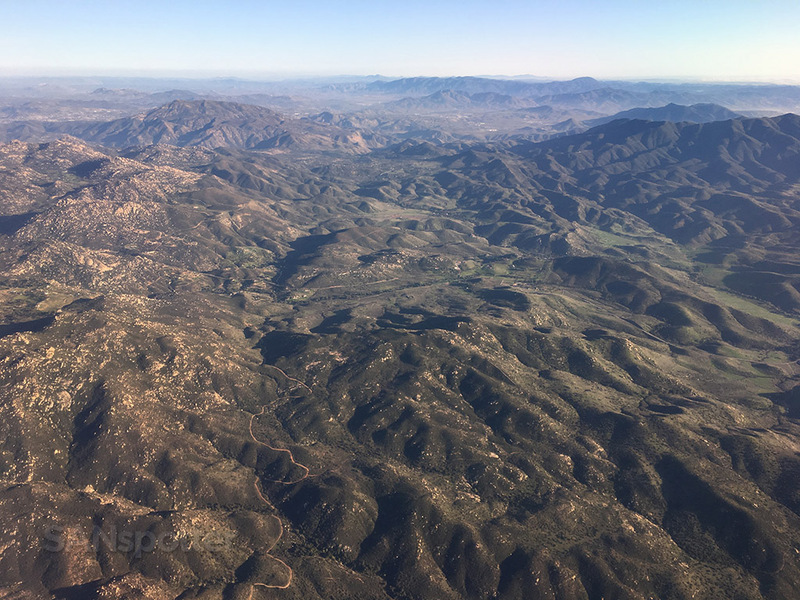 It’s hard to capture in pictures, but some of these peaks are really tall and we were skimming just a couple hundred feet right over top of them as we descended into SAN. Is this an amazing welcome to San Diego, or what? That’s Point Loma in the distance, then Coronado, and downtown in the foreground. Welcome back to San Diego! If you’re wondering why tuition at Oregon State is so high, this might be the reason. 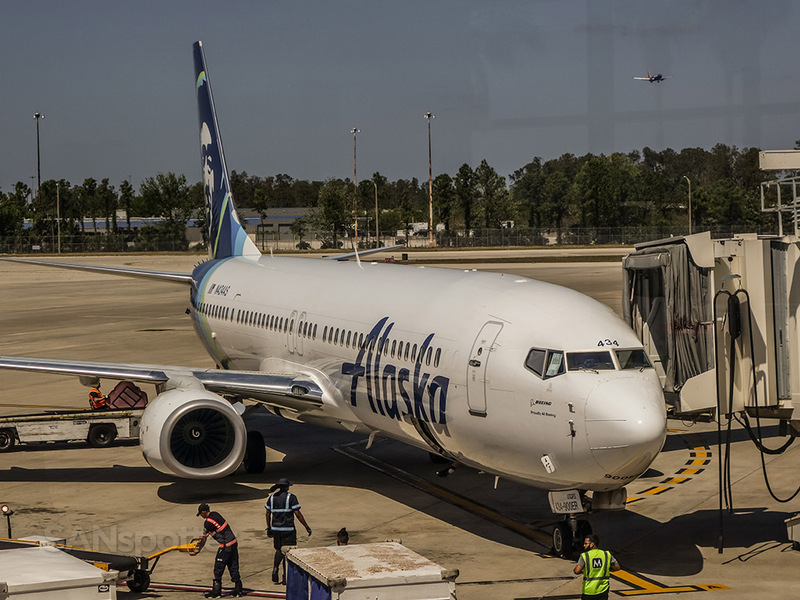 I can’t imagine how much they paid Alaska Airlines to paint one of the airplanes in their team colors! 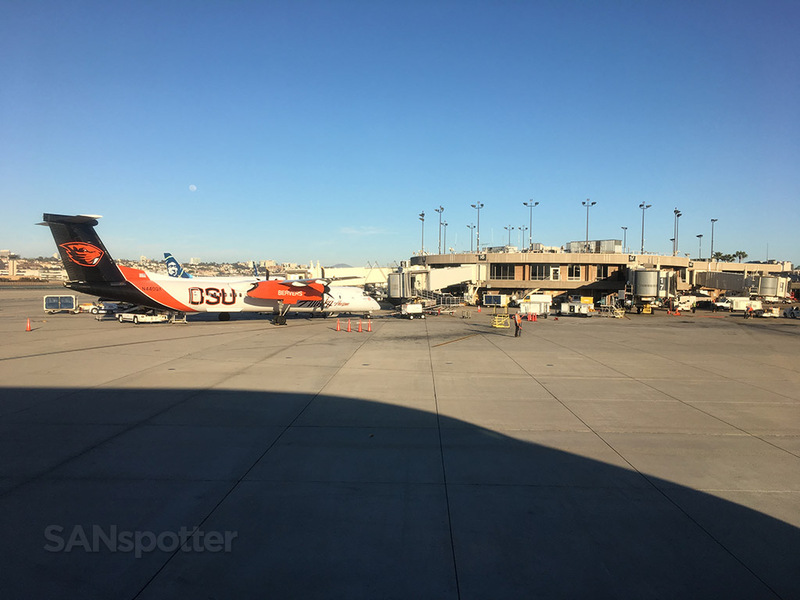 Not that I’m against that sort of thing, because hey – if they let me paint SANspotter logos all over one of thier planes, I’d be down at Home Depot right now buying the paint instead of writing this trip report. Waiting to deplane. Oh – and props to my seatmate who came prepared with a shirt that matched the mood lighting. Why didn’t I think of that? Arriving at 5 PM on a Friday evening is always madness here at terminal one. 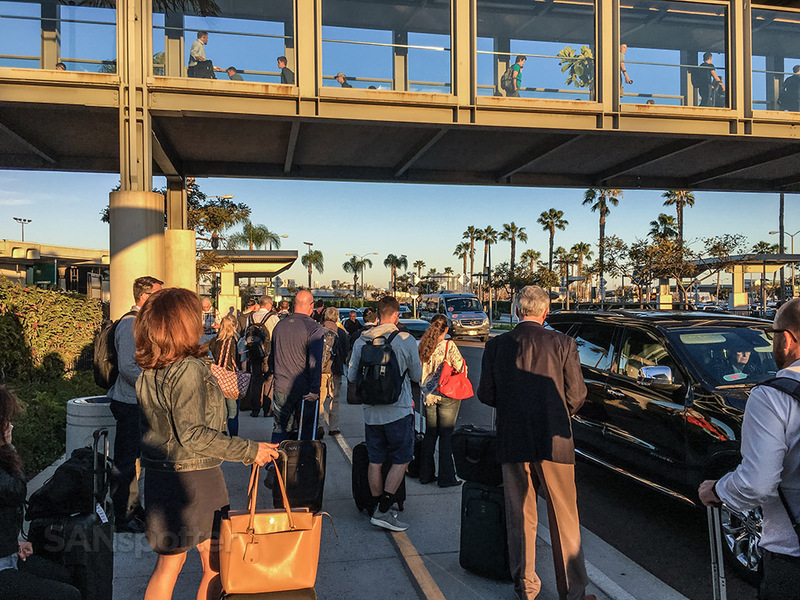 This is the Uber and Lyft pick up area, which was so crazy that it tempted me to give up and grab a taxi instead. Thankfully my Uber driver was a pro and he offered to pick me up in the short term parking lot instead. He got a well-deserved tip for that! So what do you think? 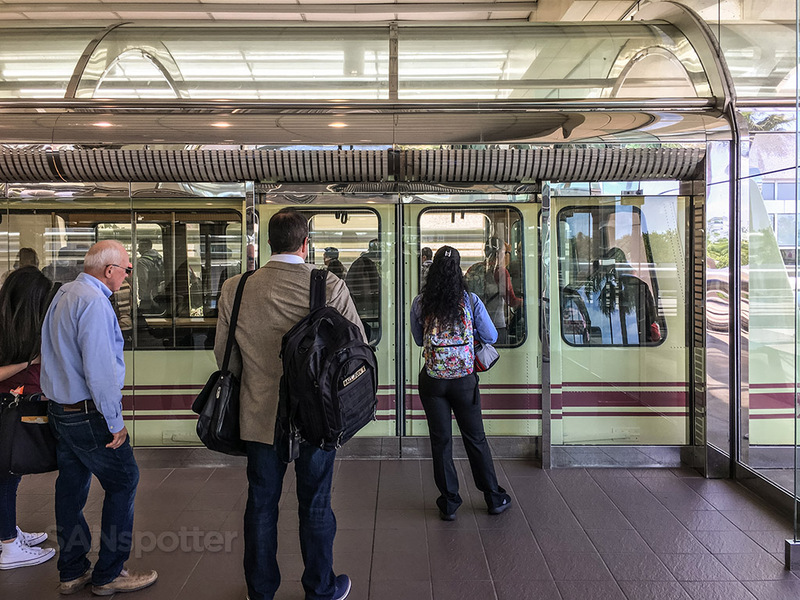 Was it worth writing an entirely new post with all new pictures, or do you think I could have got away with simply posting the previous trip report in reverse? The fact that I’m asking this question says a lot about the consistency of the Alaska Airlines first class product. 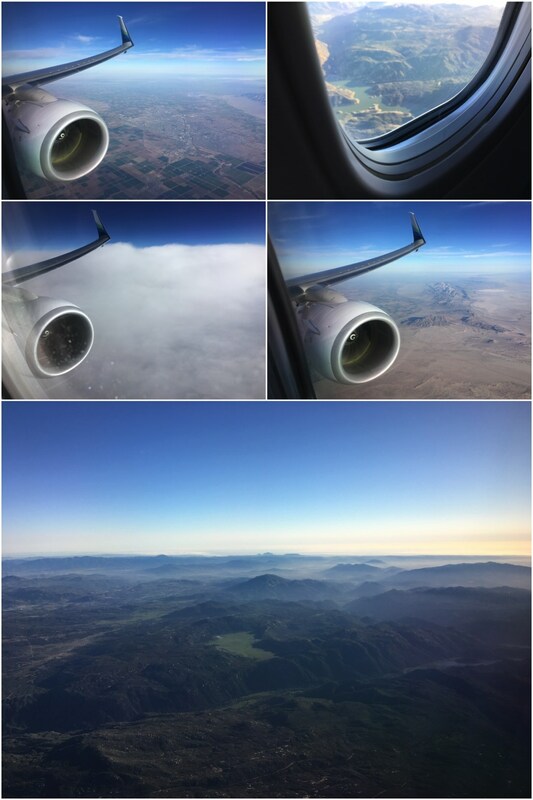 Nearly everything that I experienced on both segments of this trip happened at nearly the same times with the same high-quality levels of service. 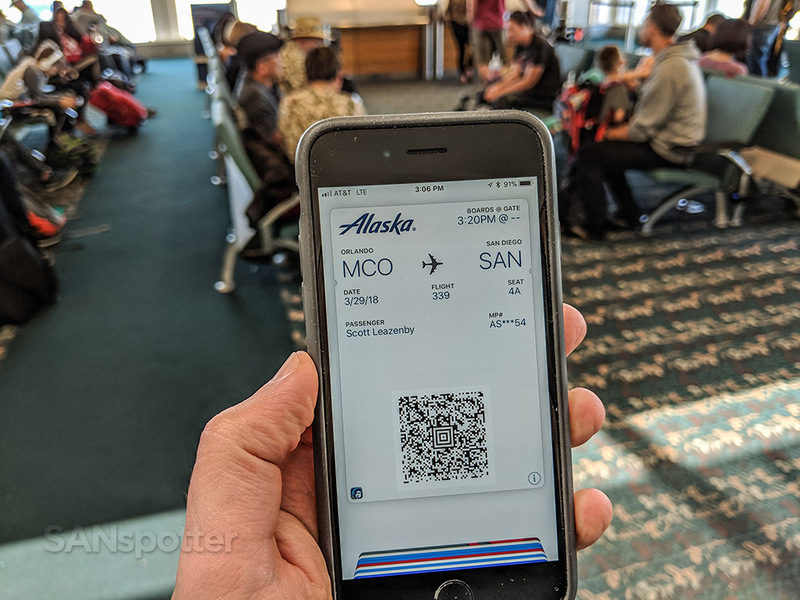 Let’s be honest here – that’s something that we don’t see very often on domestic US airlines, so it’s kind of a big deal. It’s been a while since I’ve flown first class on Alaska, but if they keep this up, I may just have to start flying with them a lot more. Thanks as always for tagging along with me, and I hope you enjoyed this quick little trip to Florida and back! 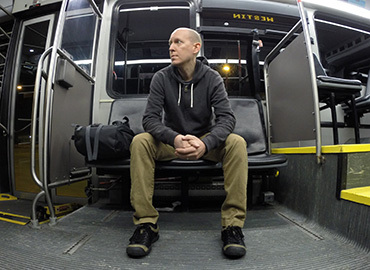 The next trip report series is going to be loads of fun, and I’m super anxious to start posting that content. Many of you already know what’s coming, but for those that don’t…well…I really hope you like Wienerschnitzel. 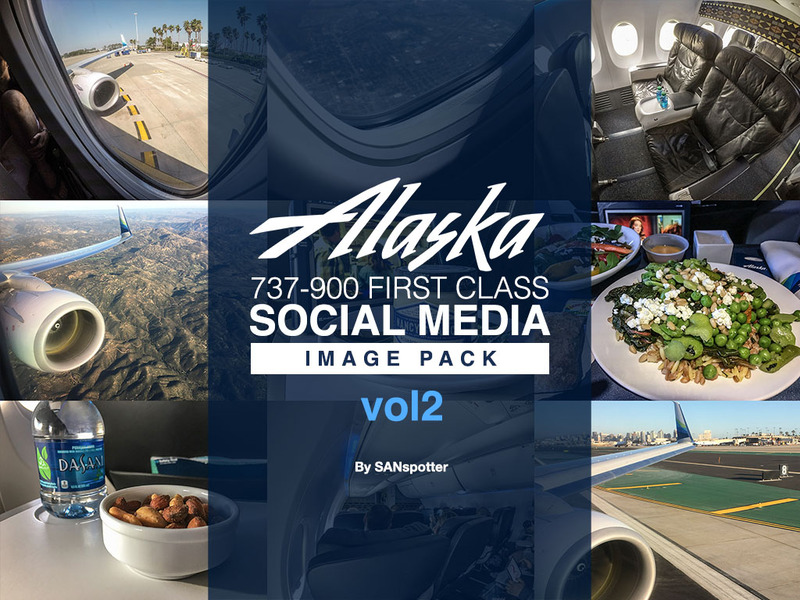 Alaska Airlines 737-900/ER first class social media image pack (volume 2). 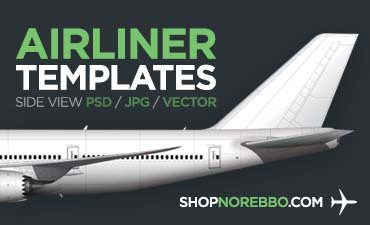 Buy it, post all the pics to your Instagram feed, and you’re one step closer to becoming the AvGeek influencer you’ve always dreamed about being (because there’s nothing cooler than an AvGeek influencer)! 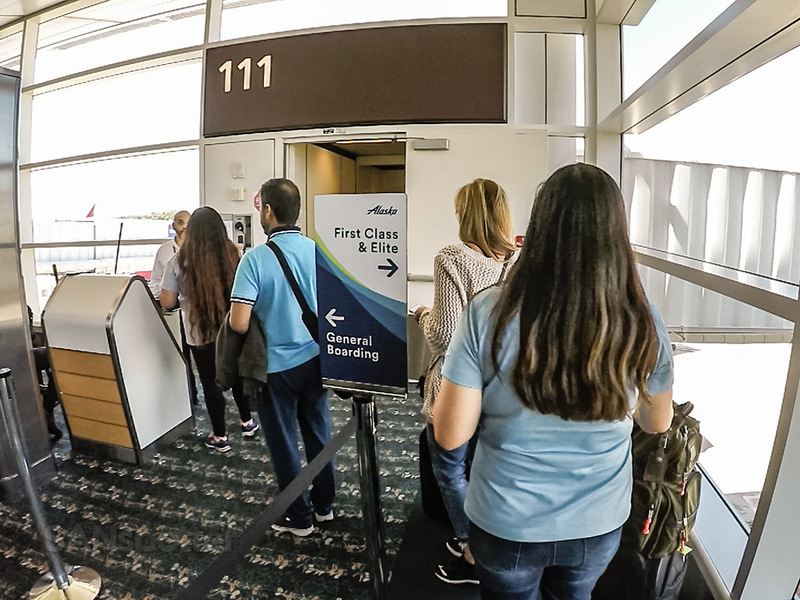 If you have a first class ticket from MCO to SAN with Alaska Airlines, do they allow you to go to the express security lane in MCO? Yes, the first class ticket will allow you through the express lane. Enjoy your trip! I really enjoyed the write up and YES it was worth it! ;) Thank you so much! Thanks Steve – I’m glad you enjoyed it!